Jonathan Holbert "Jon" Vance CMM MSC CD (born January 3, 1964) is a Canadian Army general who serves as Chief of the Defence Staff of the Canadian Armed Forces. Born in Kingston, Ontario, Vance joined the Armed Forces in 1982 and was commissioned upon graduation from Royal Roads Military College in 1986. 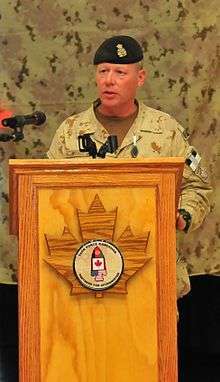 He served as deputy commander of the Allied Joint Force Command Naples, and commander of the Canadian task force in Kandahar, Afghanistan in 2009 and 2010. He went on to be Commander of the Canadian Joint Operations Command in September 2014 and Chief of Defence Staff on 17 July 2015. General Vance Has Received the Canadian Forces Parachutist Badge. By virtue of his position, he serves as an Aide-de-camp to the Governor General of Canada. ↑ Media Advisory: Governor General to Present 45 Military Decorations at Rideau Hall Marketwire (December 9, 2011). ↑ "Chief of Defence Staff". Retrieved 6 Aug 2015. ↑ "Lt.-Gen. Jonathan Vance appointed next chief of defence staff". cbc.ca. 27 April 2015. Retrieved 20 July 2015. 1 2 "Afghan vet Jonathan Vance eyed for top general post". thestar.com. 2 April 2015. Retrieved 20 July 2015. ↑ "Gen. Jonathan Vance becomes chief of defence staff, vows to tackle harassment". cbc.ca. 17 July 2015. Retrieved 20 July 2015. 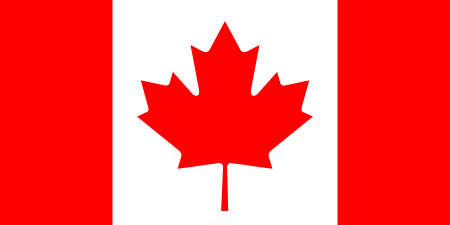 ↑ "The Governor General of Canada > Find a Recipient". gg.ca. Retrieved 23 July 2015. ↑ "Mention in Dispatches". Governor General of Canada. Retrieved 28 September 2015.